In the past few weeks I have replaced the entire drivetrain on my bike (real pics to follow someday). That is usually a daunting task, but not when you ride a singlespeed! 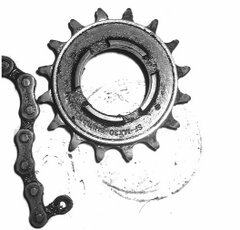 One chainring, one freewheel and one chain - no problem. If you have all the parts it is about a 30 minute task with plenty of time for beers mid-process. My setup is a Surly 38T Stainless steel chainring, a SRAM PC-48 chain (no need for anything fancier on a bike that doesn't shift) and an el-cheapo Dicta 16T freewheel (not %100 on this purchase yet, but it works, so....). Yesterday I also swapped out the brake pads on my Magura's and took a stab at truing my rear wheel. It's been years since I trued a wheel (a testament to how well my wheels were built) so I was a bit apprehensive. I remember teaching myself when I was in highschool - I really screwed up a few wheels learning. Yesterday I done good though [my blog, my grammar]. Patience is the key to getting it right, knowing how to do it properly gets you the rest of the way.